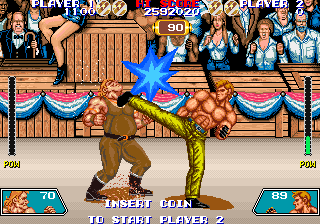 Violence Fight © 1989 Taito Corp.
Control different characters with various fighting styles and engage in single or two-player bouts. In the early 1950's, a game called Violence Fight was popular in the US crime world. Fighters from all over the USA would compete against each other to become that year's champion. The winner stood to make a considerable amount of money. In downtown LA, a manager called Blinks is training up a new fighter called Bad Blue. He is a strong contender to become the champion and desperately needs the prize money. Violence Fight was released on April 25, 1989. You can see the Twin Towers (World Trade Center) on one of the night stages played on attract mode. 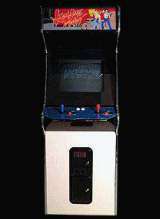 - Press the Punch and Kick buttons simultaneously to duck. - Press Punch and Jump together or Kick and Jump together to execute special moves. - When your opponent is tired, walk up and throw them with the Punch button. - Boxes and barrels can also be lifted and thrown by using the Punch button. - Proceed through six stages, each consisting of a three round bout. Win two rounds to proceed to the next stage. - Each round has a time limit of 100 seconds. - Every two stages you will reach a bonus stage. Winning the bonus stage will increase your punch or kick strength. - If you are knocked down, rapidly press the buttons to get up quickly. Profile: Bad was Street Champion last year. He has a sharp fighting technique and is tipped to be this year's champion. Profile: The 'Eagle of Nevada', Ben is a former Marine. He is very agile and can make impressive jumps. Profile: Lick Joe is a former professional wrestler, but had his licence revoked after killing or seriously injuring 13 other wrestlers. He is very strong but slow. Profile: During his childhood, Lee was trained as an assassin in China. Profile: Ron has incredible destructive power and a head so hard that he can crack rocks with it. Profile: Tony is the other favourite to win and he will do anything to ensure that he does. Boot machine with service switch pressed. Message appears: SERVICE SWITCH ERROR, press 1p Start(x3), service switch, 1p Start. Message appears: SELECT BY DOWN SW, select level with joy Down/Up and push Start button. Sony PlayStation 2 [JP] (aug.25, 2005) "Taito Memories Gekan [Model SLPM-66092]"
Microsoft XBOX [EU] (mar.31, 2006) "Taito Legends 2"
Sony PlayStation 2 [EU] (mar.31, 2006) "Taito Legends 2 [Model SLES-53852]"
Sony PlayStation 2 [US] (may.16, 2007) "Taito Legends 2 [Model SLUS-21349]"
PC [MS Windows, CD-ROM] [EU] (mar.31, 2006) "Taito Legends 2"
PC [MS Windows, CD-ROM] [US] (jul.10, 2007) "Taito Legends 2"